Venice, one of the most visited places on earth, we would think is rich. With an expected 8-10 Million tourist visiting each year and the resulting taxes from those tourist, it would seem that there is plenty of money to take care of this small city. And it would also seem that if they brought even more tourist, that they would have even more money. But alas, that is not how it works. Much as the days of the Roman Empire and Caesar, the taxes are “rendered” to Rome. Rome divides the spoils of war as they wish. So Venice works harder and produces taxes for Rome. Rome in return has cut the funds they return Venice in each successive year. The irony here is that more tourist mean more taxes go to Rome while in Venice more tourist mean more police and public service requirements which must be paid for our of the city ever shrinking budget. And of course, we should not forget the disappearing millions absconded by, well just about everyone involved in the MOSE Project. The problem is an Italian problem, lack of growth and the constant struggle to maintain their commitments to the European Union for debt. (Remember the frenzy over Greece.) Venice has cut their debt down to about 30 Million Euros from the 64 Million of a few years ago. But not without cutting services to locals, schools, and almost every public office. So how to solve this Venetian budget problem? They are selling off state owned properties, even the police headquarters, parts of the local university, parking garages, administration buildings and a harbor, an x-hospital and more. You can see the properties for sale on the interactive map below. Which one of these great palaces, public buildings would you buy? 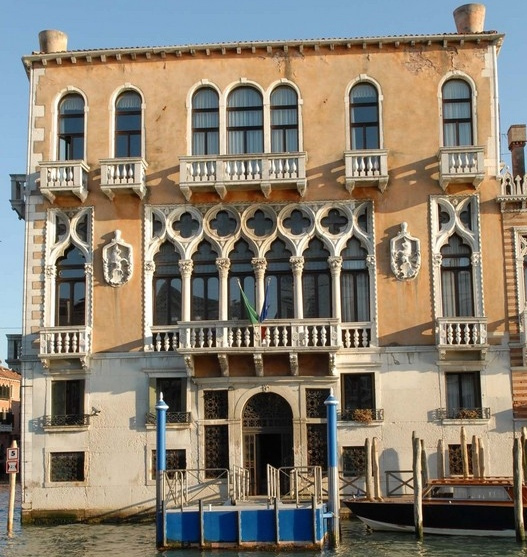 My favorite is Palazzo Contarini with it’s Grand Canal view, private landing, great spot on the Canal and at night, the chandeliers can be seen through the windows in the “piano noble” (main floor). It was built by the famous Contarini family who can claim eight Dodges of Venice beginning in 1043 with the last one in 1676 and one of the 12 founding families of Venice. There should be lots of secrets in this palazzo. For Sale – Palazzo Contarini Grand Canal! It actually gets more complicated as it appears that many of these properties have been silently acquired by “holding” companies, including Cassa Depositi & Prestiti and Fondo Immobiliare Invimit, who now gets the rights to sell these properties on the open market and surely stand to make a tidy sum which will NOT be going into the city’s coffers! Remember MOSE! This is horrible, what can be done about this huge problem? Darlene, I do not think there is anything. We can only hope that the privatization means they will preserved, even if in the form of an exclusive hotel. It cost an amazing amount to maintain the Venice.